Cover image © Sort of Books. After reading the first book about Chris Stewart's life on his Andalucían farm, Driving Over Lemons, I couldn't resist going and buying the 'sort of' sequel. The first book had been about the establishment of Chris and his wife Ana in there new farm El Valero and the trials of becoming self-sufficient. This book pretty much carries on where the last left off. 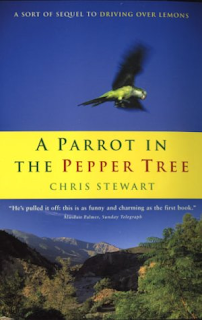 The subtle differences being that they are older and wiser (in terms of their Andalucian adventure), their young daughter is older and wiser and a parrot turns up in the pepper tree - although we later learn that the parrot is in fact a parakeet and the pepper tree isn't even a pepper tree. This aside, the book has all the same charm as the first installment and just like the first installment leaves you wanting more. Damn you Chris Stewart write another book! The book tells of Chris' time in Sweden sheep shearing, of being in the original line-up of Genesis, of the 'trials' of becoming a writer, of the arrival of Porca (the 'parrot) and of the dam that threatens their Spanish paradise. This set-up is just like 'The Good Life', without that annoying Penelope Keith character, only in a different setting - much warmer climes - and is well worth a read if you have read the first book.